Spyke Super Torque Starters for Big Twins 1989-Up will give you 46% more cranking torque than stock. There is no need to buy a bigger battery since modern technology is used and a very little amp draw is required. There is more than enough torque for any bike with this intelligent gear reduction design and a show design. available in chrome, polish or wrinkle black. 300 cold crank amp battery. Spyke has added Sportster Starters to its line of Super Torque Starters. 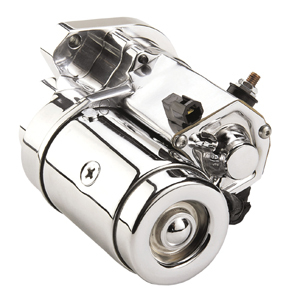 The Sportster Starters are designed with the same features as the 1.4 Big Twin Super Starters. Spyke has added to the line of Super Torque Starters for early models from1965-1988. R&D was done on a 16:1 compression bike that wouldn’t even start to turn over. After installation of Spyke Starter it was as if the bike was stock. There is more than a 200% increase in torque over stock with this intelligent gear reduction design.